First Harm the captain sailed the Phoca as close as possible to the uncovered seabed. There the people were dropped off on the plates using the dinghy. One of the children helped the skipper to collect the fishing nets. Later on a modest shrimp harvest was cooked on board. 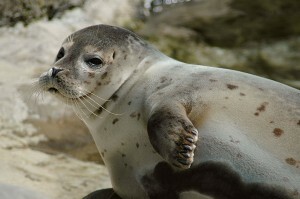 The equipment was brought to a place where there were lots of seals, who came swimming very close out of curiosity. Awesome to face the seals eye to eye, while at medium height standing in the grey wavey water, thanks to the wading suit. Also there were squid and hermit crabs and shells fished. The kids could see them in a nice translucent bowl brought by Josephine, the indispensable shipmate. The cuttlefish changed color. Naturally those creatures were all carefully being returned into the sea. For the day, both captain and shipmate were our ambassadors to another world.